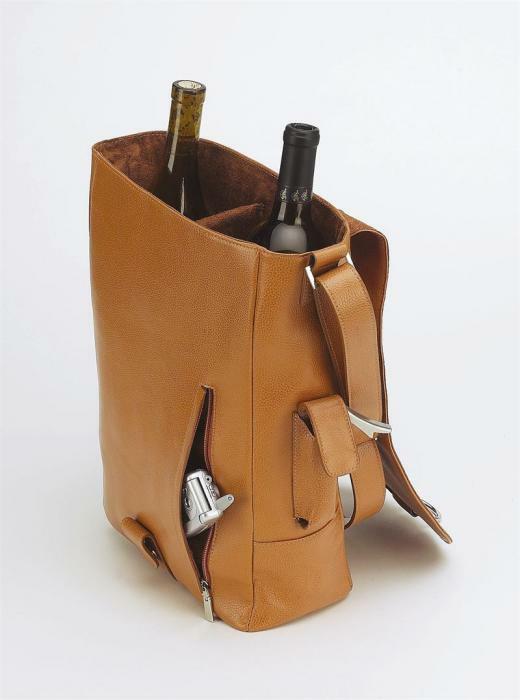 For the wine connoisseur on the go, the Primeware wine tote makes the perfect companion. 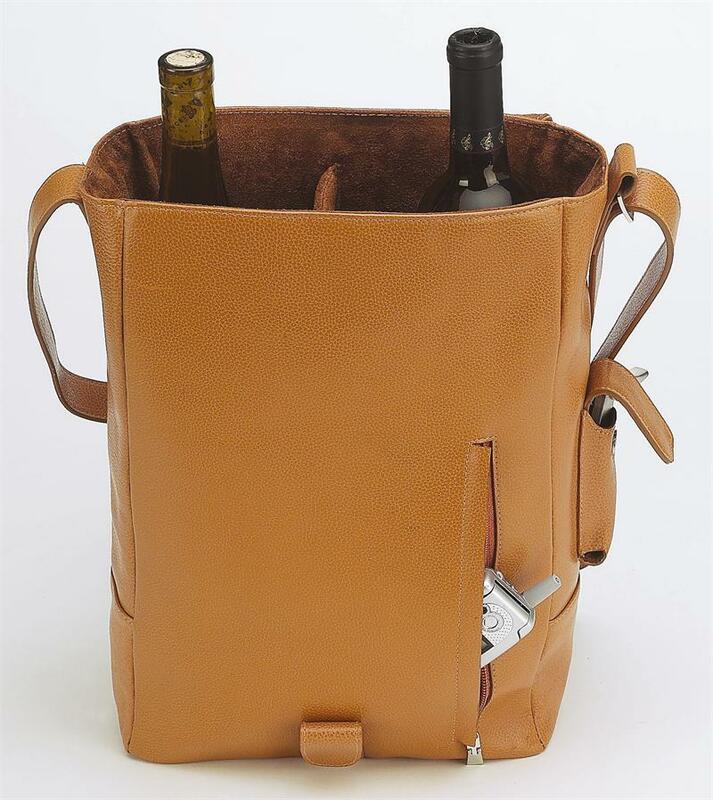 The 2-bottle wine tote is a great addition to your travel itinerary, whether you're going on a romantic getaway or hanging out with some friends. 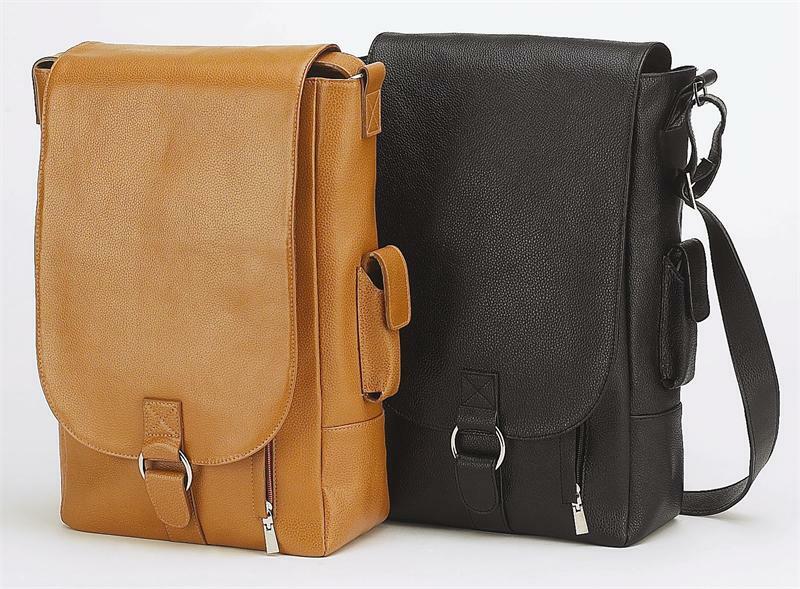 The stylish bag is made of a leather shell and features a convenient carrying shoulder strap that makes transporting the two bottles simple and effortless. 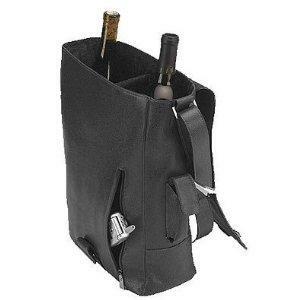 Inside the messenger bag design is a well-padded compartment for each bottle, which ensures your wine is safe and secure when traveling. Not only does the sophisticated bag comfortably hold two bottles but it also includes a stainless steel corkscrew and an extra pocket for additional storage. I love the camel color. This item is not only handsome in appearance, it truly is functional. I ordered several more as gifts! The bag is very attractive and feels to be of good construction. It is nice because it fits two bottles with the center flap between them so they don't clink, but you can easily fit three snugly if you slide that back. I am definitely happy with my purchase and this site offered the best price I could find (good value). I absolutely love this bag! It is really classy and was sent safely and quickly. Thank you for selling this item. It was larger than I anticipated but my husband loved it. It is made of a nice leather but I would prefer a firmer tote and have used it several times eating at restaurants. But no picnics yet. This wine tote looks impressive - even my husband is not embarrassed to carry it into a restaurant. It is well made with heavy duty leather! I am pleased with the product and promptness of arrival. Excellent value for the price. This was the least expensive tote that I found. I was very pleasantly surprised. I am going to buy this product again for a gift. It was purchased as gift for a male friend.He loves it! We frequent BYOB restaurants and this is the only one of its kind we have seen. I personally thought the leather could have been a better quality! It's a beauty! Quite roomy, enough for 3 bottles. The leather is very rich...not at all like pleather. I wish the lining was weighted down (it tends to lift when removing the bottles) I gave it to my sister for Christmas and she absolutely LOVED IT!...she's very picky!!! You should realize it is not 'the finest leather'. That said, it is very nice and what I expected. Primeware (formerly known as Picnic Gift) was established in 1999. Our goal was to design and manufacture a unique, functional, high quality product for our customer's needs, as well as the needs of their customers. We continually improve upon our already remarkable and versatile product. Our products are backed with a lifetime warranty. From the coffee lover to the wine connoisseur, from the romantic picnic for 2 or a family fun outing, we offer several picnic backpacks in a variety of sizes, colors and styles. We also offer a more traditional style picnic or wine basket. Our backpacks and wine totes are designed with heavy duty polyester canvas, insulated compartments for wine and food, melamine or ceramic serving ware, cotton linen, stainless steel flatware, wood cutting boards, and much more. Each design is unique to its use, from a single wine bottle tote to a fully loaded picnic backpack for (4). Our product has proven to be a wonderful gift idea for people with a variety of styles or walks of life in mind. We offer these products to you, our customers at competitive market prices.